An assessment of Malaysia at the half-century mark here. 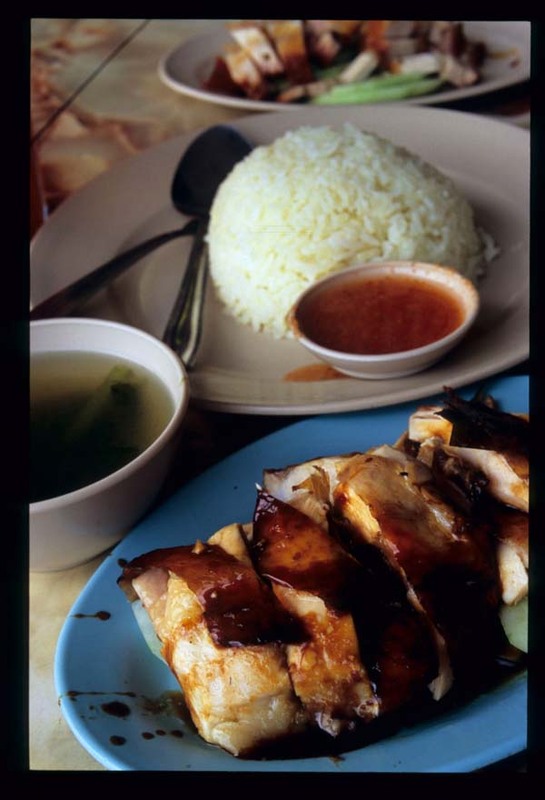 Melaka's famous chicken rice balls were born - so the story goes - of hardship. About fifty years ago, when Malaysia was in its infancy, a young woman from the southern town of Muar married a Melakan fisherman twelve years her senior. 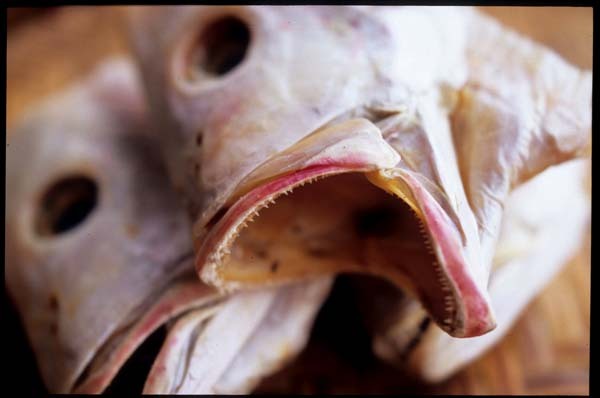 The couple lived an uneventful life until, one day, the fisherman pursued a catch into Indonesian waters. He was picked up and detained for months, his boat and net impounded. While the fisherman, named Hoe Kee, languished in an Indonesian jail his wife struggled to feed their children. She did loads of laundry by hand for a pittance, and then took to peddling Hainanese chicken rice at Melaka's main jetty. Each morning she prepared rice and chicken at home and then transported the the food, in separate containers hung from either end of a kandar (shoulder pole), to the docks. Her customers were the men who loaded and unloaded boats. There was no such thing as official meal breaks; time was money and food had to be dished up and eaten as quickly as possible. The housewife figured that she might be able to sell more rice if it were easier to handle, and so she began rolling it into compact, bite-sized balls. She sold them for ten Malaysian sen a ball, two balls and a portion of chicken for fifty sen.
A Melakan specialty was born. Hoe Kee eventually managed to give his jailers the slip and make his way home, but without his boat and nets. He threw himself into his wife's business, which was already humming along nicely. Three years after Hoe Kee's wife began carrying fowl and rice to the jetty on her shoulders the couple expanded beyond a kandar and two pails, to a shop on a central Melakan street that local Chinese called Ji Chang Jie - 'chicken market street'. Pretenders soon opened copycat businesses serving the same twist on Hainanese chicken rice, but Mr. and Mrs. Hoe Kee had already cornered the market. Hoe Kee - the shop took the fisherman's name - maintains its lead position to this day. Some time ago the wife (her husband has passed on) and her children, who now handle day-to-day operations, acquired a lovely former kapitan's house on Jalan Hang Jebat. 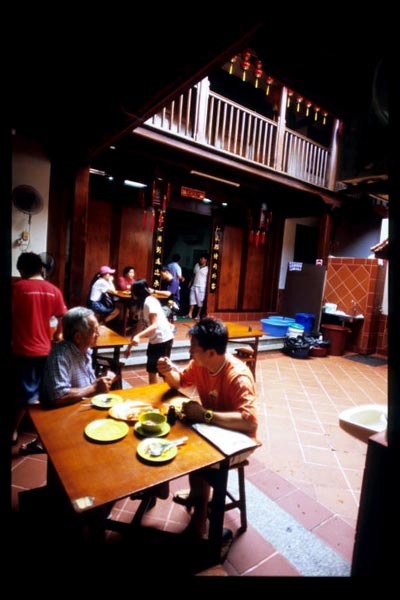 After wrangling with Melaka's bureaucracy they attained the permits required to convert the house to a restaurant and undertook a restoration of the building, which is characterized by its typically Melakan central, open-air courtyard. Mom, now in her seventies, pops into the shop on occasion to taste and reassure herself that everything is still up to snuff. 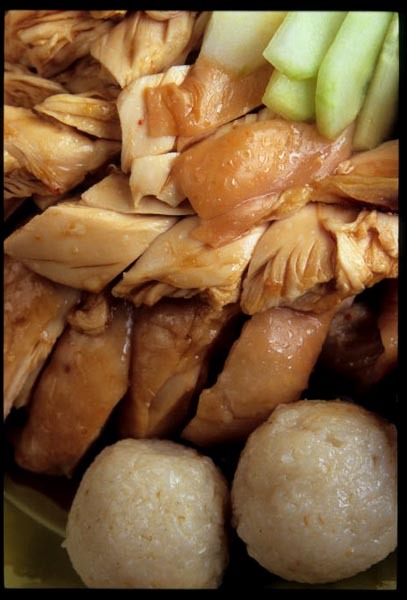 Over the years she has introduced other dishes, like Malay assam fish and Chinese soups such as lotus root and peanut and black beans boiled with chicken feet and red dates, that have become as popular as her chicken rice specialty. The balls are no mere gimmick. The rice, cooked with chicken stock and flavored with garlic, ginger, and spring onion, is rolled by hand while it is still hot, resulting in a firm but not leaden orb of pleasantly sticky rice. Hoe Kee's steamed chicken, though cooked beyond the still-pink-at-the-bone stage, is moist and juicy, and the accompanying chili sauce distinguishes itself from other versions with its pronounced kalamansi and vinegar-stoked tartness. 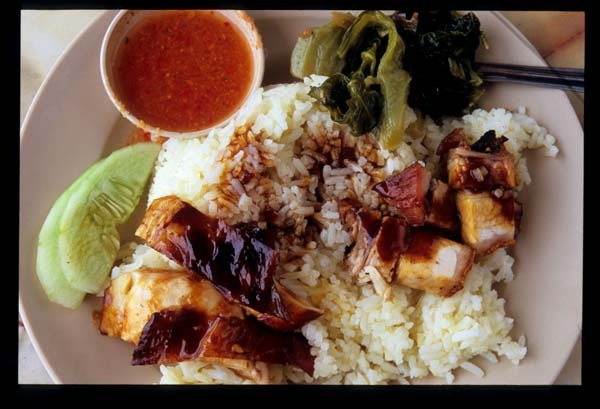 Instead of the blanched bean sprouts served with Ipoh's version of Hainan chicken rice, Hoe Kee serves cooked shredded cabbage studded with slices of bouncy fish sausage. Soups vary according to the day of the week. 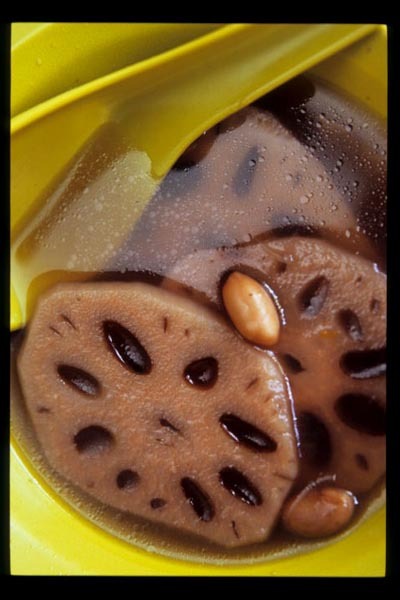 Lotus root features a mild, light, and comforting broth and slices of toothsome root. Four second-generation siblings - three sisters and a brother - run the Hang Jebat restaurant together, while brother number two operates another business elsewhere. Of Hoe Kee's thirteen grandchildren, one (the eldest brother's eldest son) has also opened his own chicken rice shop. Hoe Kee's youngest daughter Tan Hin Ngoh is confident that Hoe Kee will one day be taken over by the third generation. Hoe Kee, Jalan Hang Jebat (aka Jonker Walk), Melaka. Open morning to evening. Closed one day a month. Buy My Greens! Buy My Greens! When we launched EatingAsia in 2005 an (at the time) Saigon-based, trailblazing food blogger suggested we incorporate the occasional bit of video. Two years later, we're finally getting around to it. Today, EatingAsia enters the twenty-first century. A couple weeks ago Dave and I took a first-time visitor to Malaysia to Pasar Pudu, one of our favorite wet markets here in Kuala Lumpur. Cruising the narrow corridor that connects Jalan Pasar to the huge open heart of the market, we walked smack into the sort of wall of noise that characterizes many southeast Asian wet markets. These vendors are all selling basically the same thing - bunches of Chinese greens - for pretty much the same price. How does a vendor in a situation like this distinguish himself and his product? Thanks to Brett Martin for uploading the video (after my first two failed attempts). 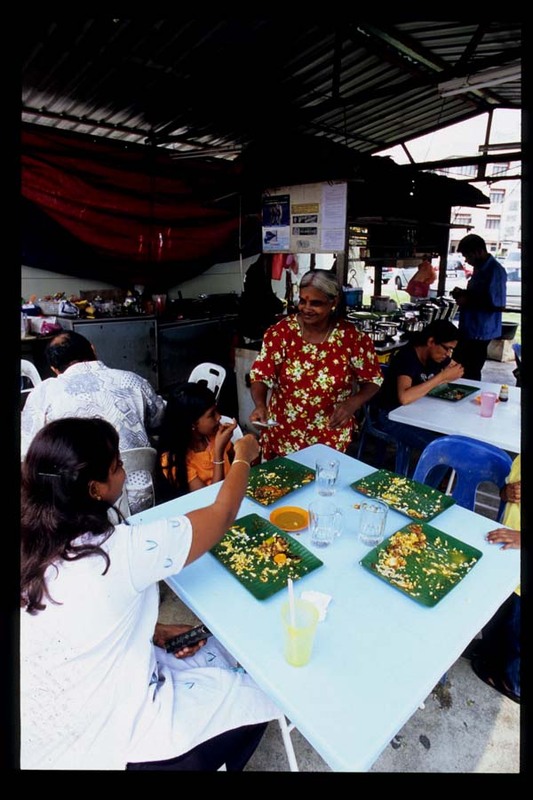 The huge contributions of Malaysian Indians to the country's culinary culture bely the relatively small size of their community. 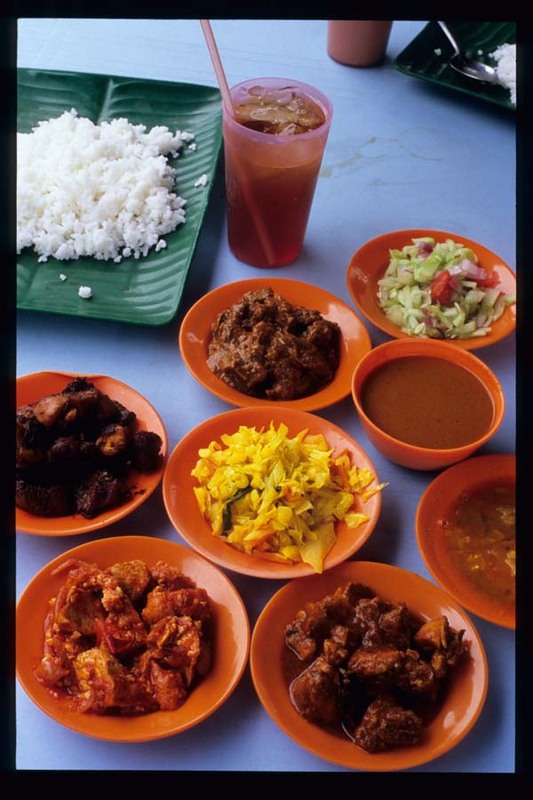 Who among us doesn't experience the occasional belly-grumbling craving for a spicy banana leaf feast? Come late afternoon, is there any corner of the Klang Valley in which one can not find that streetside snack staple, deep-fried pulse fritters? But man cannot live by turmeric fried fish and crispy vadai alone. The world of Indian Malaysian deliciousness is large and, in some instances, woefully uncharted. 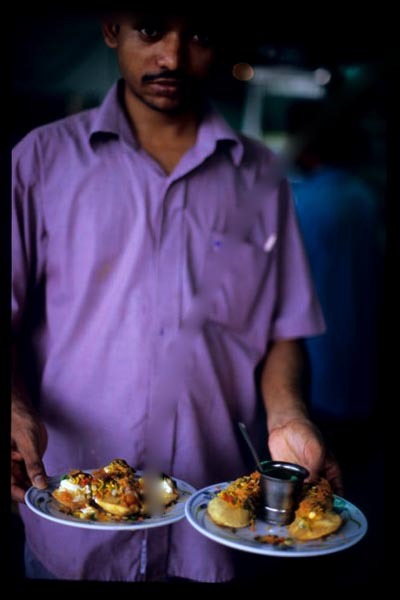 Two specialties that fly below the radar are chaat and palagaram. On a Sunday evening, as the weekend draws to a close, a steady trickle of north Indians and Pakistanis pass through the entryway of Brickfield's Restoran Chat Masala. The humble shop's menu is packed with same-same standards like saag paneer and 'Indian Chinese' dishes but its short list of 'chaat specials' at the bottom right-hand corner is a chowhoundy find. In Hindi 'chaat' means 'to lick', and that's just what you'll want to do to your plate after sampling these small bites with big, exciting flavors that somehow sate and stoke the appetite all at once. Puri, bite-sized rice flour puffs, arrive four to a plate. When an order is placed Chat Masala's chaat wallah pokes a hole in the top of each puff and fills them with - depending on whether he's making paneer or bhel or masala or panni chola puri - spicy garbanzo beans or tiny cubes of cheese or yogurt or a combination. On top goes tamarind gravy or fiery green chili-mint chutney or nothing at all. The icing on the cake is a shower of crispy orange sev (semolina noodles) and golden yellow fried dhal. 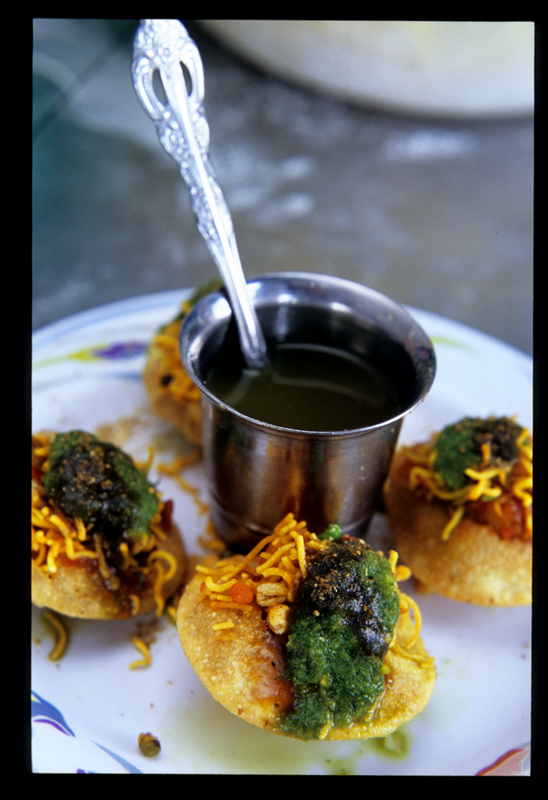 The puri are accompanied by a cup of thin sauce made from tamarind, mint, and chilies. In India chaat are made and eaten on the street. Puri like Restoran Chat Masala's are served one-by-one, and they must be popped into the mouth at lightning speed, before any sauce spooned over the top turns the delicate rice flour shells into a soggy mess. Chat Masala's restaurant setting and sauce-on-the-side set-up may allow for a more leisurely repast, but the snack's scrumptiousness induces gobbling in the end. The restaurant's other chaat, like its salad of starfruit, orange, and cilantro leaves in a hot-and-minty dressing zippy enough to awaken one from even the most serious case of hot-season torpor, share's its puri's masterful combination of contrasting tastes and textures: sweet and tangy, salty and spicy, wet and dry, smooth-soft and crackly-crunchy. 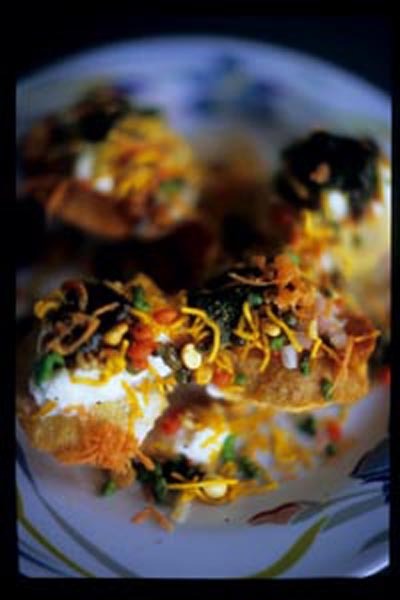 Chaat may be meant to be taken as a quick, light snack, but their addictive flavors never fail to inspire indulgence equivalent to a meal. As north Indians in the Klang Valley have their chaat, so Tamils have their palagaram (or palaharam). The word once described a class of foods prepared specifically as offerings for particular Hindu deities, but these days palagaram serve purposes both sacred and secular. While offered during prayers inside the temple, they're also taken outside as between-meal snacks, often accompanied by tea. 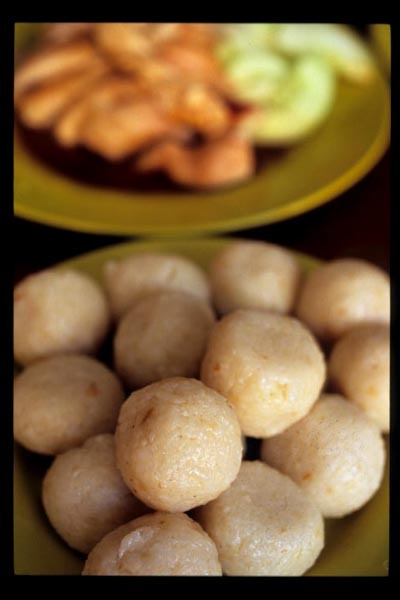 A post-lunch visit to Restoran Mohana Bistro in Klang's Little India finds customers munching on kolakatta, steamed rice-flour dumplings filled with sweetened lentils, which are a favorite palagaram of Lord Vinayagar, the Elephant God. Hanuman, Hindu monkey deity and symbol of physical strength and devotion, prefers vadai strung into a garland. 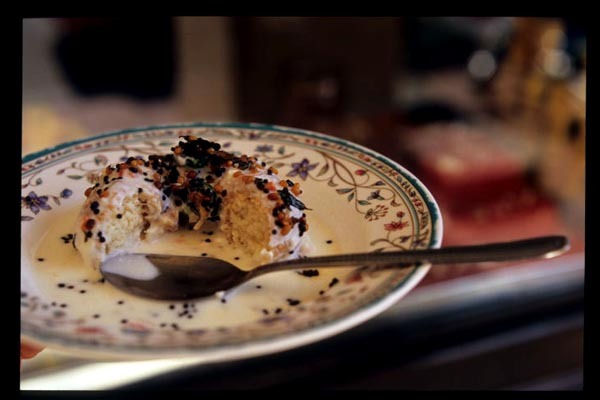 On Mohana Bistro's menu are thairu vadai, a soft version of Hanuman's gram flour 'donut', soaked in and then doused with yogurt and dusted with crispy aromatics such as deep-fried curry leaves, chili flakes, and popped black mustard seeds. Across the street at Asoka Curry House, a banana leaf-lined tray of spicy chickpeas delivered fresh from the kitchen to the restaurant's streetside palagaram station is quickly depleted. Meanwhile, orders are filled for more thairu vadai (a version much less 'wet' than Mohana Bistro's) and boli, featherweight gram flour 'crepes' perfumed with cardamom and filled with jaggery-sweetened mashed dhal. Unlike chaat, palagaram are served morning to night, though variety and availability increase exponentially come late afternoon. Much like their northern Indian chaat cousins, palagaram boast an astounding mix of flavors and textures and an intense spice-forwardness that's bound to tickle even the most jaded palate. Food of the gods, indeed. We came across this guy (or girl, we're not sure which) a couple weeks ago in one of the seafood sections at Kuala Lumpur's Pudu Market. 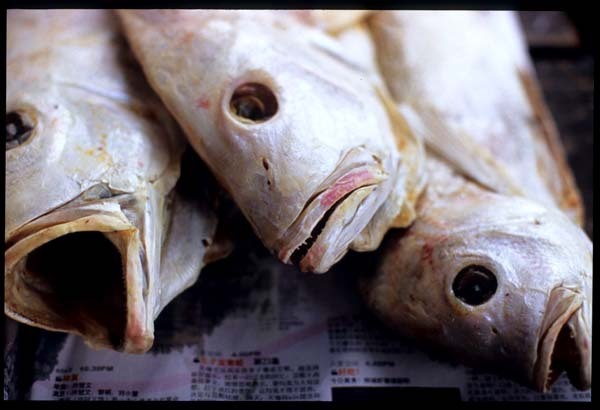 He was offered for sale alongside mackerel and snapper and prawns. 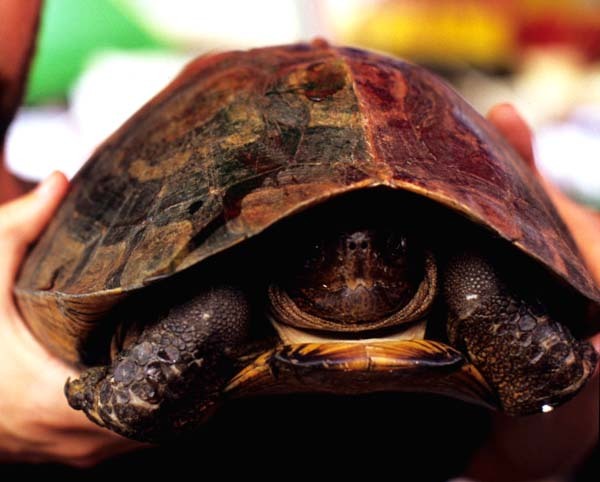 His mottled shell stretched at least fifteen inches front to back. Turtles (or tortoises, we're not sure which) don't grow fast; he had to have seen at least a couple of decades on this earth. We couldn't imagine him ending such a long life in a soup pot. 'Should we buy him?' we wondered. Dave and I have a fairly large garden, and we've both long been enamored of turtles. We've swam alongside them off Thailand and Hawaii. They somehow strike us as noble creatures. With the encouragement (and bankroll) of a sympathetic friend we negotiated a price with the seller. He, claiming that this specimen would draw one million in Hong Kong (really?!) wanted 300 ringgit (almost one hundred US dollars). We offered two hundred and he waved us away. We came back at 250. In the end the vendor - no doubt pitying the foreign nutters, with their utter lack of bargaining savvy - took 200. We trundled LB (his name) off to the car and hurried home, where we soaked him and set him on a damp towel on the grass. We cheered when he stuck his head out of his shell and took a teeny step. We set some greens and water out for him and, figuring he needed to recover from his near death-by-cleaver, let him be. The next day, as I was furiously googling, trying to figure out whether he was a tortoise or a turtle (different diets, different water needs), LB passed on. He'd been with us for only 24 hours, but it felt like a defeat. Who knows what he'd endured in the days leading up to his appearance at Pudu. Now he lies in our garden, where we'd hoped he'd live out a long life. We can only hope he sensed his return to the outdoors in his last hours. Rest in peace, LB. We tried. Not many visitors to Kuala Lumpur are lucky enough to score an invitation to a home-cooked meal. But the beauty of a food culture like Malaysia's, which celebrates street and hawker food, is that mom-cooked dishes are as likely to be found on the street as they are in the kitchen. In Brickfields, this mom-and-pop serve soulful renditions of southern Indian specialties from their small corner stall. They start early, preparing everything from scratch in a makeshift 'kitchen' at the back of the little shed. Strolling by post-roti early one morning last week, we spotted mom frying and dad furiously chopping in a haze of heavenly-scented, karhai-generated fumes. There was never a doubt that we'd return ASAP to taste the fruits of their labors. Here, rice is served on a banana leaf-textured plate rather than an actual banana leaf ('Cleaner,' says mom, and who's going to argue with the cook?). 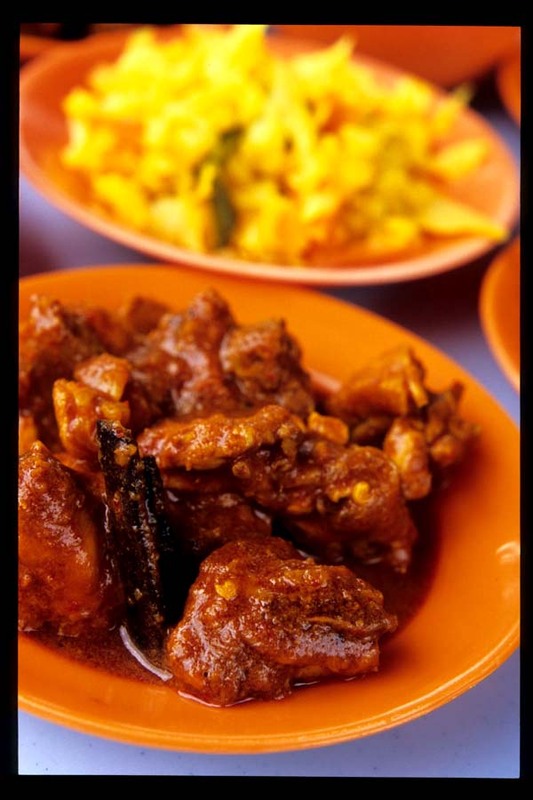 As at any banana leaf stall there are a variety of curries and gravies on offer, as well as fried fish. We opted for (clockwise from bottom right) 'wet' chicken curry, tofu curry, 'dry' chicken curry, mutton curry, a chopped, salted cucumber/tomato/onion relish, fish gravy, and dhal with (in the center) turmeric-braised cabbage on the side. Mom's wonderful curries evince subtle, but distinct, differences: the mutton curry is full-on fragrant with warm spices like cloves and cardamom, cinammon and dried chilies do delicious battle in the wet chicken curry, the smoky-charred dry chicken curry (below) is classically flavored with curry leaves and cayenne, and the tofu - in contrast to the meat curries - is lightened by slightly sour tomatoes and sweetened with caramelized onions. The fish gravy is thin, sour, and completely addictive. 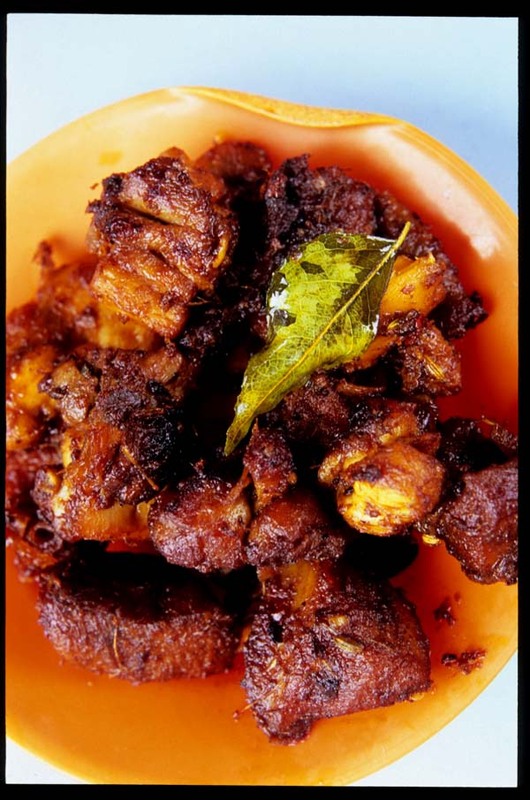 Mom's sharp lime pickle (below) refreshes and surprises the palate with its pleasantly astringent tartness and the pop of plenty of black mustard seeds. 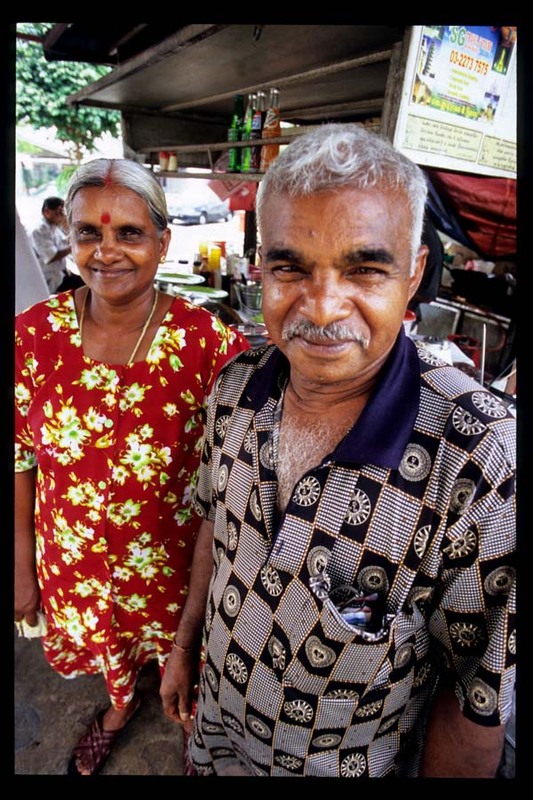 The couple, who've been feeding Brickfields here for over eighteen years, see steady business throughout the day - which is not at all surprising, considering that their reasonable prices include service with a very hearty smile. Banana leaf stall, Jalan Sultan Abdul Samad at the corner of Jalan Berhala (opposite Hamsa-Yahini Travel and Tours), Brickfields, Kuala Lumpur. 9am-11pm. Closed Sunday. Isn't it time you got out a bit? You know, did a little traveling? Bangkok's a perfectly wonderful place, and I know you have lots of fans there. But isn't it a wee bit stifling, limiting yourself to one city? It's been more than eight years, after all. 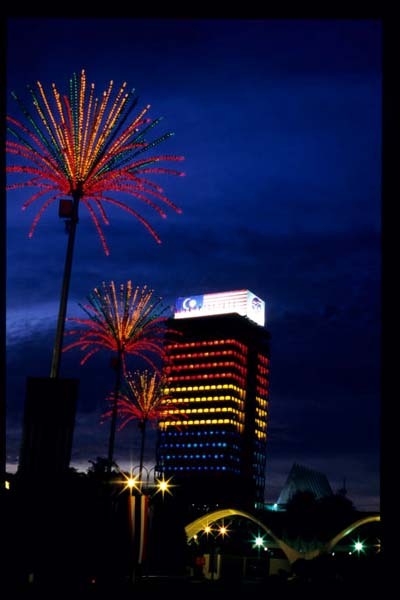 Kuala Lumpur, for instance, is a fantastic town. It's hotter than Bangkok, and you know what sticky weather does for ice cream sales. 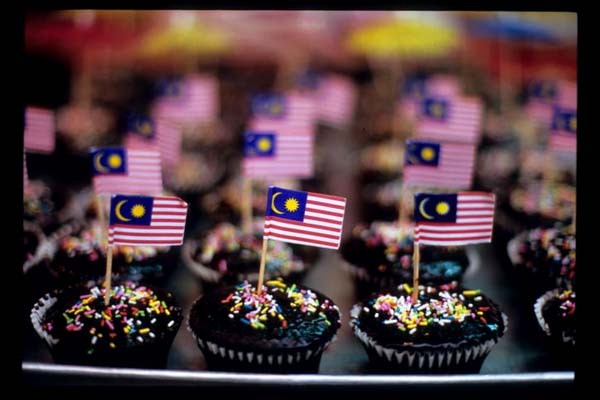 You might not be aware of this, but Malaysians have a real sweet tooth. They're crazy for tiramisu and cheesecake - your frozen versions would go over big, I think. 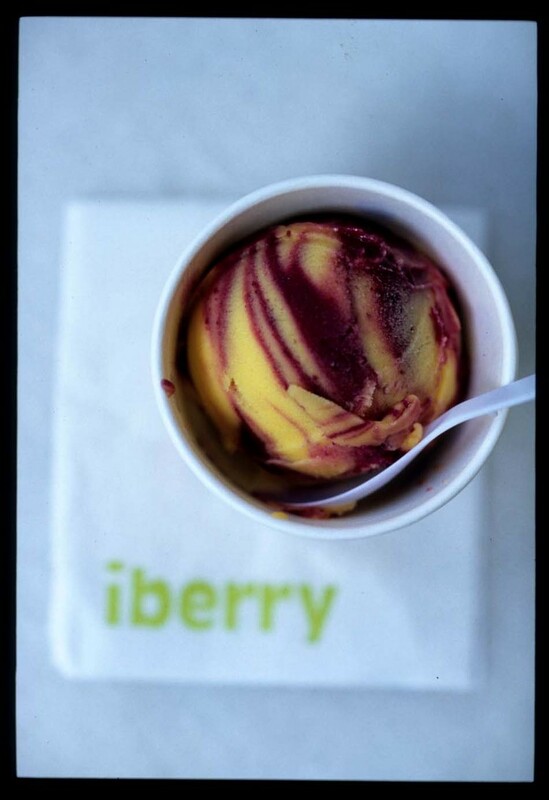 I'm betting most KL-ites have never tasted anything the likes of your mangosteen sorbet. 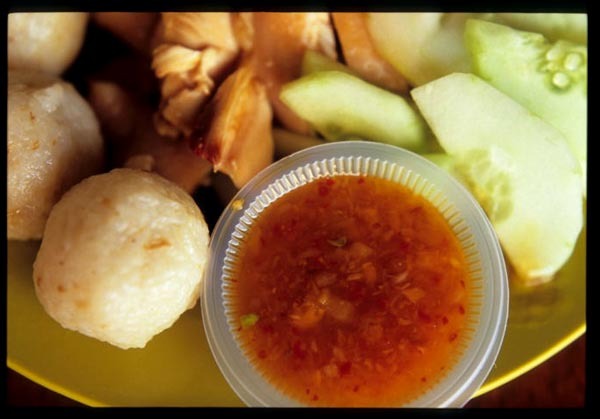 Is it fair to share all your goodness with Thais and leave the rest of us out in the cold? OK, I'll admit it. This message is purely self-serving. After my Thai teacher introduced us five years ago we had a kind of thing going, if you remember. Thai iced tea ice cream one afternoon, tamarind sorbet the next, Horlick's the following evening. I balked at bananas and cheese, but you proved yourself. I never doubted you again. Then, suddenly, it ended. I begged you to follow me to Saigon, but nothing doing. You've cruelly held out all these years. You know what I think of Swensen's, you know I can't bring myself to pay ten dollars for a pint of Haagen Dazs. You won't come to me, and you know I can't stay away from you. Especially during gooseberry and mango seasons. It's time, iberry, for you to give something back. I've put way more into this relationship than you have. I'm putting my foot down. 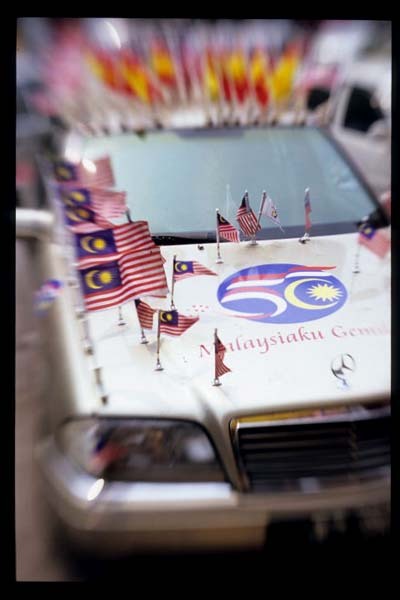 Set up a Malaysian franchise, now, or we're through! Until my next trip up north. 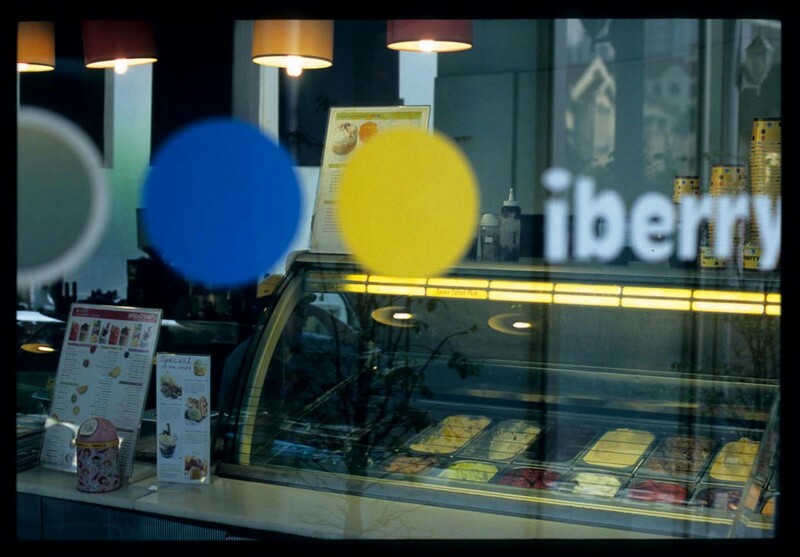 Iberry ice cream shops, various locations around Bangkok. Kiam chai boi, a sour vegetable stew, is a Malaysian leftovers dish. What stale bread is to panzanella, cooked vegetables from a roast are to bubble and squeak, and lechon is to paksiw, meat (usually pork) doggy-bagged home after a Chinese wedding banquet or other celebration is to kiam chai boi. Wedding banquet invitations don't come along every day, so we usually get our kiam chai boi fix in PJ's Section 17, at a coffee shop that also houses a stall serving prosaic pan meen and another dishing up a laudable not-Thai tom yam. 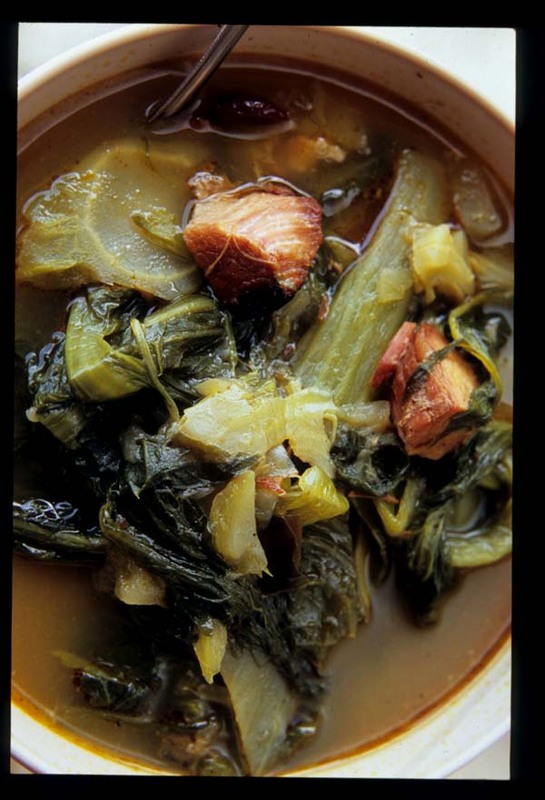 Like all kiam chai boi this stew features mustard greens two ways - pickled and fresh - and is soured with assam keping (lit. 'sour slice'), an ingredient that's often mistakenly described as tamarind peel but is in fact the dried flesh of a hard, green-skinned fruit called buah assam gelugor. The broth is rich and meaty but pork pieces aren't prevalent, which in our opinion is a good thing. This is a side dish, after all. 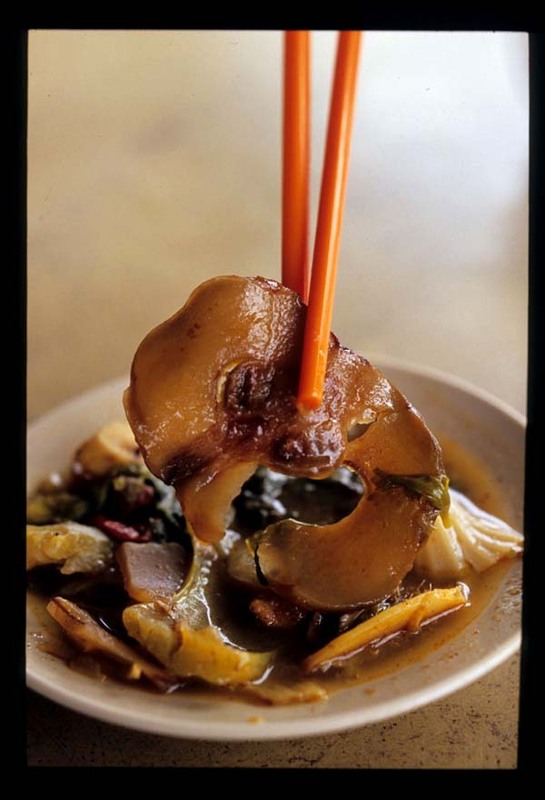 Copious coins of ginger, along with plenty of dried red chilies, lend this version considerable hot to balance the sour. What to eat with kiam chai boi? 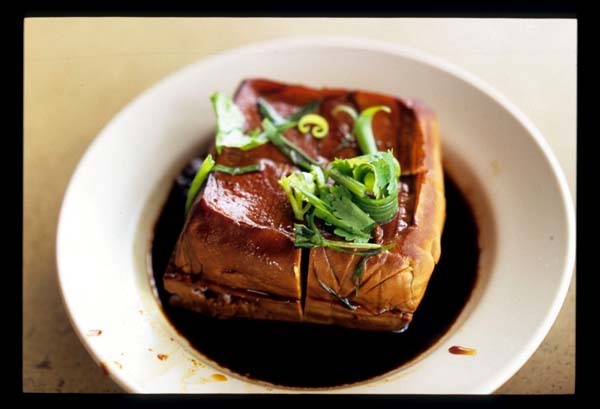 This vendor offers a number of options, the best of which is soy-braised tofu: firm-skinned, creamy-centered blocks of flavorful bean curd (if you think bean curd has no flavor you haven't been eating the right bean curd) infused throughout with the warm spiciness of their salty, star anise-scented braising liquid. Bean sprouts sauced with garlic and soy are a fine accompaniment. Tofu and kiam chai boi make for an awfully light meal, so adding an order of superb moist and crisp-skinned roast chicken isn't at all gluttonous. 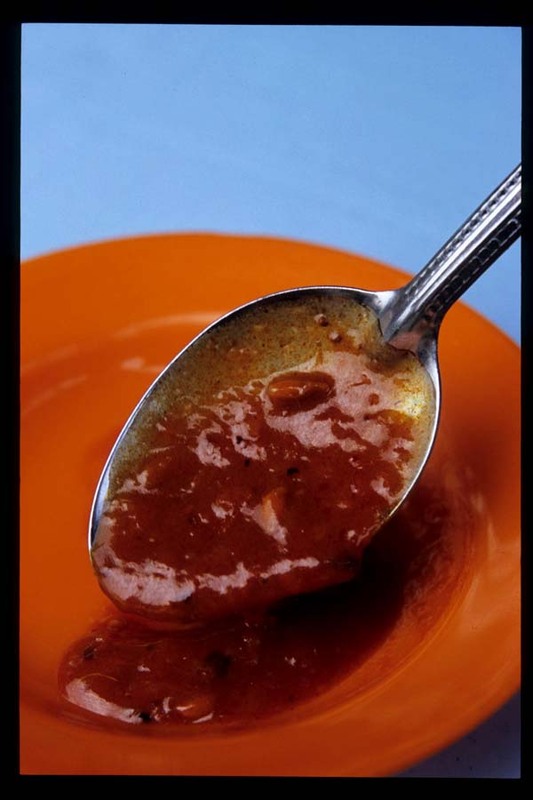 The bird is doused with sweet dark soy sauce and served with stock-boiled rice, a small bowl of clear soup with a leaf or two of vegetable, and a sinus-clearing sourish chili sauce. Roast pork (char yoke) is also on offer here, though its fat layer lacks requisite melting-ness, suggesting that it is not this cook's forte. No matter. It's really the kiam chai boi and tofu first, roast chicken following at close second, that inspire repeated visits to this stall, both to eat in and take away. 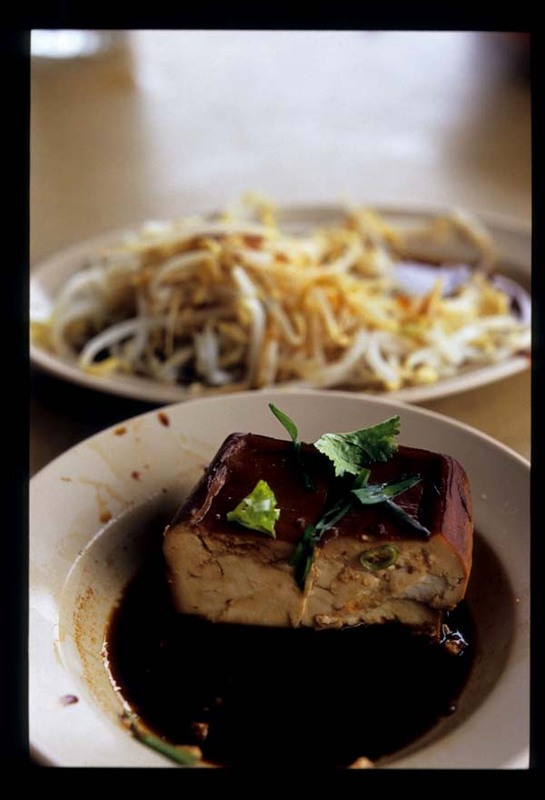 Kiam chai boi, soy-braised tofu, roast chicken and pork vendor at Kedai Kopi Wah Cheong, Jalan 17/29, Section 17, Petaling Jaya. Early morning-230p or so. Closed every other Thursday. In the world of Thai desserts, it's sweet khanom bueang - crispy Thai 'pancakes' filled with cream and egg threads - that get all the attention. I don't think I've met a Thailand-traveled farang who hasn't raved about them. For my baht, nothing beats khanom tuai, a two-layered coconut dream that may score low on the cute scale (no mini tacos here) but sits high in the if-you're-going-to-indulge-you-might-as-well-go-all-out rankings. This sweet named for the dish it's steamed in ('tuai' means cup or small bowl in Thai) consists of a layer of smooth coconut jelly capped with silky coconut cream. 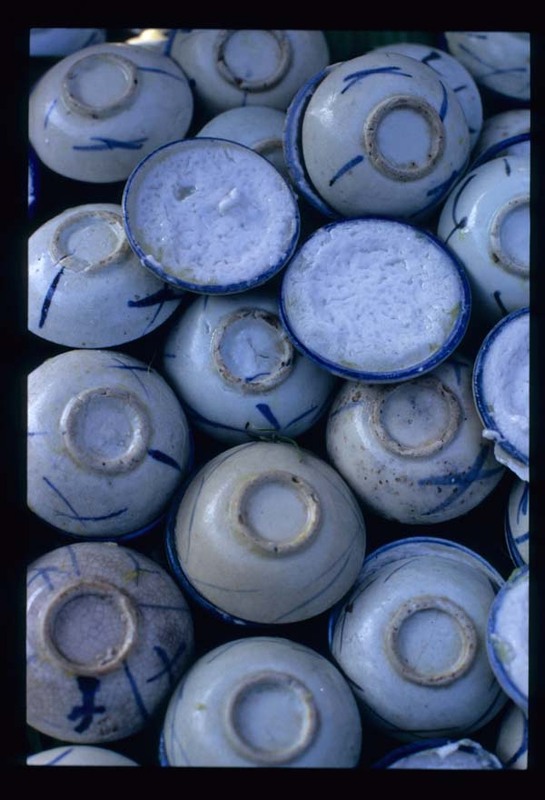 Both small cups and larger saucers serve as khanom tuai molds. I favor versions steamed in the latter, for their higher coconut cream-to-jelly ratio. I've been known, after my fourth or fifth, to scrape the coconut cream into my mouth and toss the jelly. 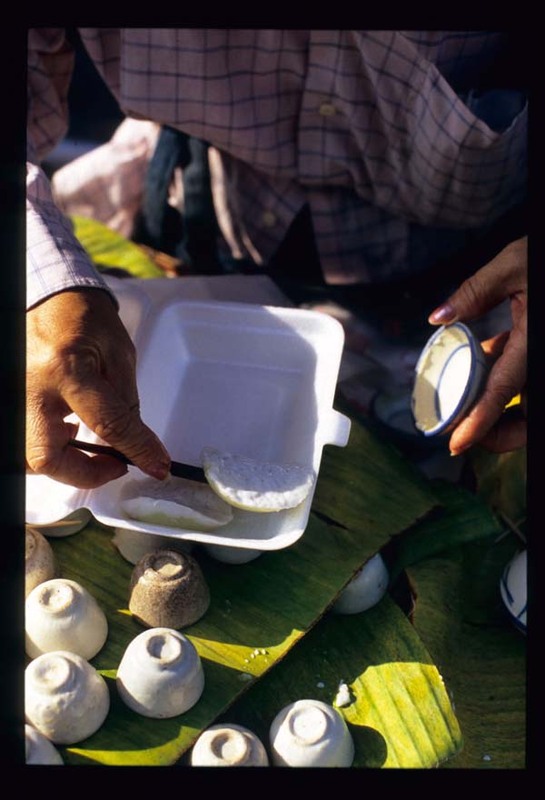 The best khanom tuai makers add a good bit of salt to the top layer, an inspired move. The salt slices right through the almost obscenely unctuous coconut cream, 'lightening' the treat and facilitating further gorging. As with any street food, quality varies. Still, I've never met a khanom tuai I didn't like. 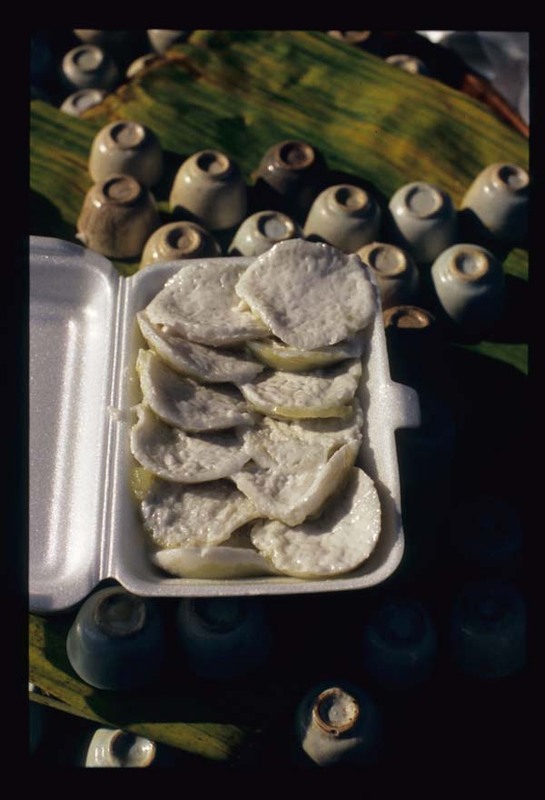 Kanom tuai, sold on a street corner near you (if you're in Thailand) - keep an eye out for the cups. Ten or twenty baht for more than even I can eat in one sitting.